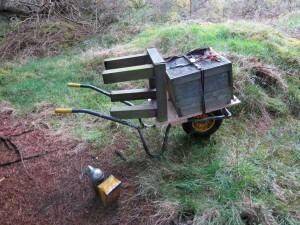 A beekeeper’s barrow is a handy item to have if, like me, you cannot bring your car right up to your beehives. One can be built from a frame from an old builder’s barrow and a few bits of scrap wood. My first bee barrow was built for me by my late Dad. This frame has lateral steel strips with holes in (originally to attach the bucket) fore and aft of the legs which allowed Dad to fix the platform directly to the steel strips with bolts. The platform was made of 12mm marine ply with small pieces of scrap oak (about 15mm x 15mm x 40mm) screwed & glued to the upper side of the platform to stop the hive parts from slipping off. Notches were cut front and rear to allow a tension strap to fit snugly around the hive parts to hold them together. My hive parts are 460mm x 460mm National standard. 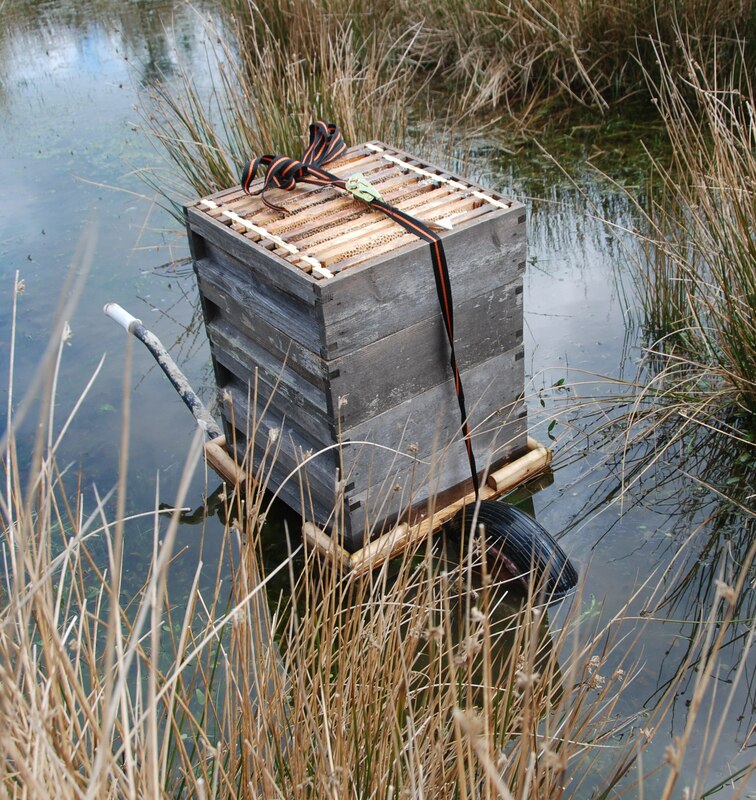 As the picture shows, this hive barrow was an amphibious vehicle. It was a good solid item that lived outdoors with the beehives and served me well for about 5 years, until someone stole it from my Coillte apiary last year. The load sits above the legs and as such a large proportion of the weight is carried by the driver. It would be better to have the platform further forward. The platform is canted slightly forward at rest and further forward when in motion. 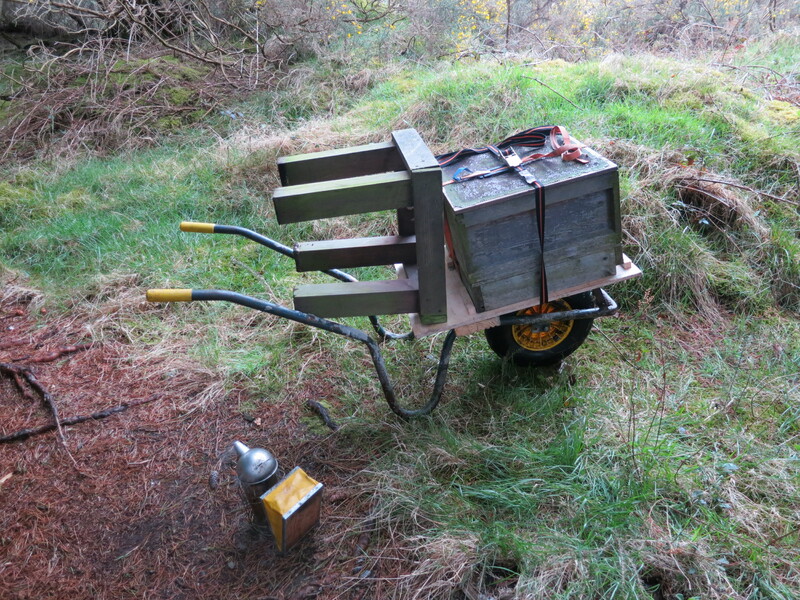 This necessitates the load being very well secured and makes the barrow a little harder to handle on sticky or uneven ground. As it happens, the next frame from a builder’s barrow that came my way (you can sometimes see them in skips) was built differently. It had no lateral steel strip behind the legs, but instead had lugs with holes in on the top of the tubular frame just in front of the wheels. This allowed me a different design: I sited the platform above the wheel. The rear of the platform was raised by adding two old decking boards above the steel strip, and the platform rear, decking boards and frame were all bolted together. Two brackets with holes drilled in at either end were made from an old steel bar and bolted to the lugs on the frame. These support the platform at the front. Small angle brackets bolted to the platform hold the steel brackets to the platform. 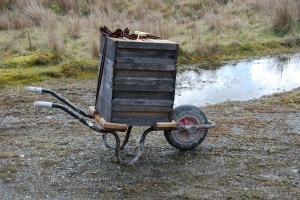 The resulting barrow Mk II has proved itself on its maiden voyage. 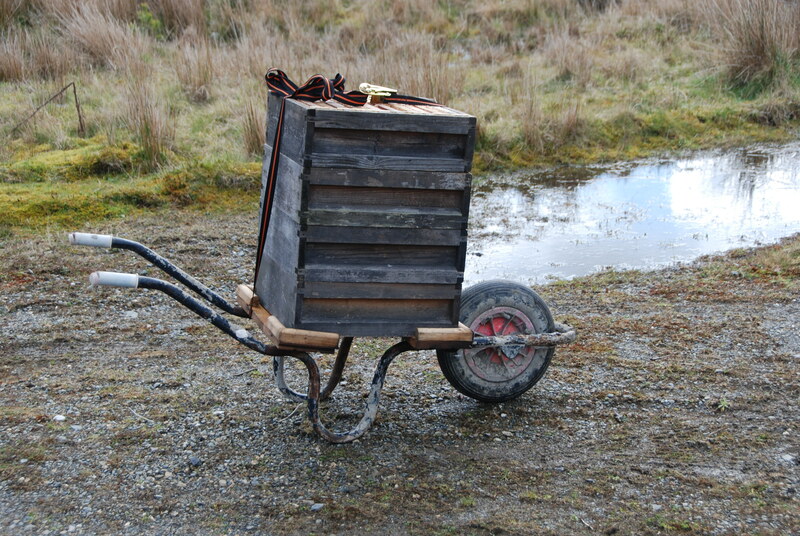 The load proved stable and the barrow was easier to drive than the Mk I. The platform is designed to be level when being driven on level ground – which means that it is canted backwards a little too far for ease of stacking when at rest, so I will point the barrow downhill when loading to compensate. If I was building one from scratch I would follow the advice of my wise friend Joe Kelly and build it with a bicycle wheel for improved ground clearance. 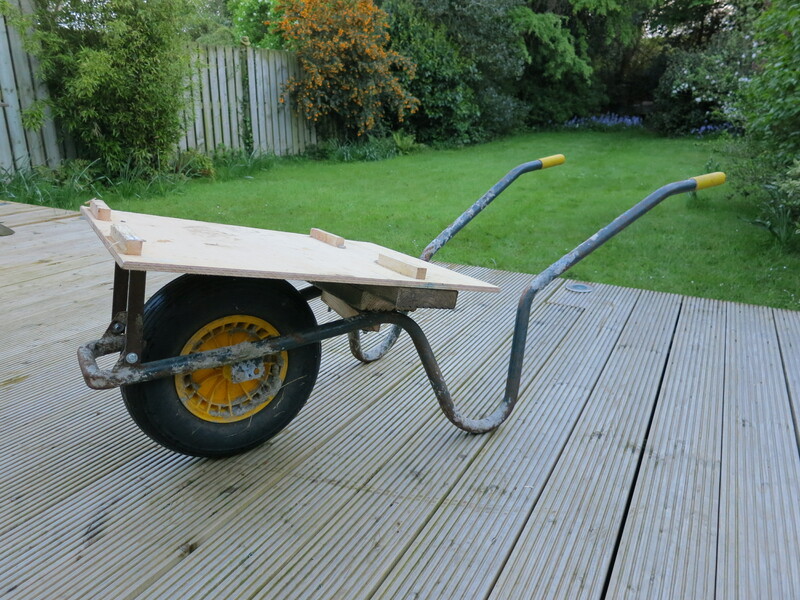 However, this barrow cost me nothing bar some 12mm marine ply that I had to buy anyway, and scrap timber & spare bolts & steel that I had lying around. For the parsimonious beekeeper (is there another kind?) the challenge is to find a suitable barrow chassis, with a tyre that’s still serviceable. I am already looking out for another. One could of course buy a builder’s barrow from the builder’s merchant, but where’s the fun in that? This entry was posted in Beekeeping and tagged Beekeeping, beekeeping equipment, Bees on May 16, 2013 by Simon Rees.